Kept and Referred To All Year Long. Our competitors' almanacs are only 64 pages. 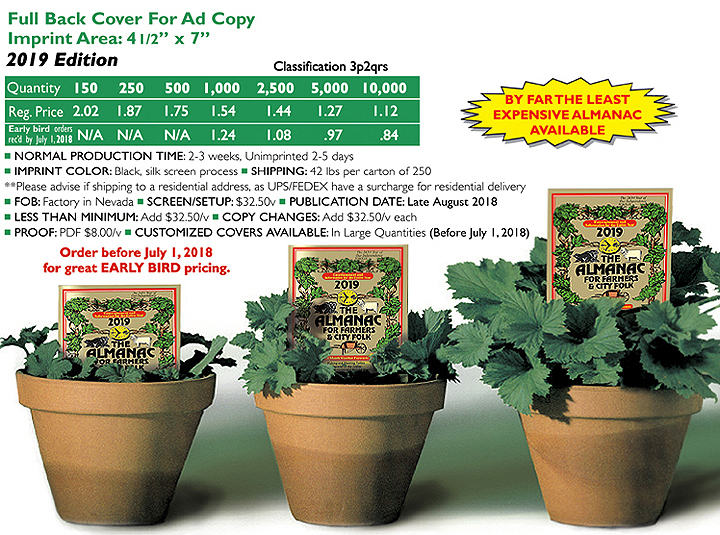 THE ALMANAC is a compendium of Fun, Fact & Fancy... providing repeated daily exposure of your advertising message and image all year long... much more than any calendar. This book is informative and entertaining, featuring Astronomical data, Civic and Religious calendars, Accurate weather forecasts, Gardening and Planting, Fishing tables, Secrets of the Zodiac, Millennium information, Interesting Articles and Stories, Cookery, Contests, Puzzles. . . and more. 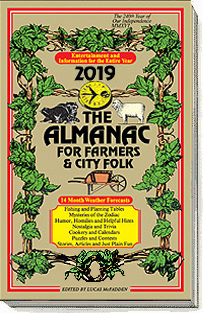 THE ALMANAC is packed with interesting and helpful information, and Calendars as well! Successfully utilized by Banks, Credit Unions, Drug Stores, Feed & Seed Stores, Garden Centers/Nurseries, Farming Supplies & Implement Dealers, General Stores, Contractors, Landscapers, Funeral Homes, Real Estate/Insurance Agencies. . . In fact, THE ALMANAC is great to promote virtually any Business, Profession, or Institution! The time to order is NOW, don't delay! 4 1/2" x 7" GO TO ORDER FORM.